In the tumult of the circus surrounding Judge Brett Kavanaugh’s Supreme Court nomination, little attention was paid to President Donald Trump’s speech last week before the United Nations. This is a shame, because his address last week was arguably the most significant foreign policy address any U.S. president has delivered since the end of the Cold War. Many of Trump’s critics insist his view of the world rejects the liberal world order America has led and defended since the end of World War II. But that assessment misconstrues Trump’s world view. Indeed, that ignores it. Trump’s critics cannot see his world view because they are convinced the universe of foreign policy is but a narrow linear spectrum that veers between isolationism and globalism. Trump, who has been a peripatetic foreign policy practitioner since his early days in office, is manifestly not an isolationist. He does not believe the U.S. can walk away from the world. He is deeply engaged with the world. His argument with the globalists is not about whether the U.S. should be engaged with the world. His dispute with globalists and globalism revolves around the form U.S. involvement should take and what the proper goal of that involvement should be. The four post-Cold War presidents who preceded him in office — George H.W. Bush, Bill Clinton, George W. Bush and Barack Obama — differed on many things. But they shared the basic globalist view that U.S. foreign policy should be undertaken to advance ideological goals not directly related to U.S. national interests. They all agreed with the basic proposition that the U.S. should carry out its foreign policy under the aegis of international or transnational governing structures, which they perceived as somehow more credible than unilateral action or action undertaken in informal cooperation with likeminded governments. 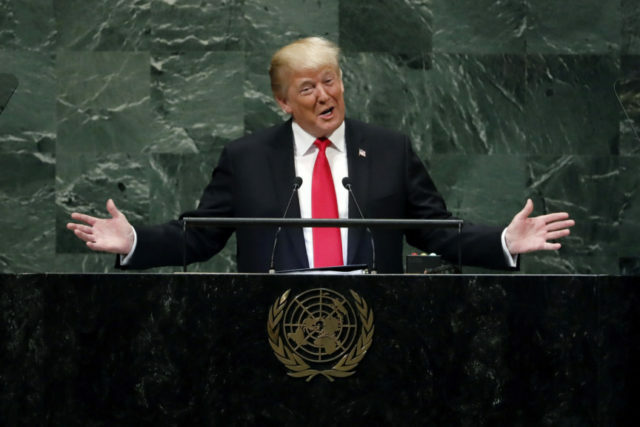 In his address at the UN, Trump rejected that general disposition. Trump explained that the purpose of U.S. foreign policy is not to advance hypothetical universal values. It is to promote real American interests. The Monroe Doctrine guided U.S. foreign policy for a century. It protected both the United States and the independence of the nations of Latin America. In the aftermath of World War I, then-President Woodrow Wilson, arguably the first globalist president, sought to tether the U.S. to the League of Nations, a global government created in the 1919 Treaty of Versailles. The League of Nations was supposed to prevent war through global consensus. Opposition to the treaty in the Senate was led by then-Senate Majority Leader Henry Cabot Lodge (R-MA). Lodge’s 1919 speech explaining why the U.S. must never accept any form of global governing authority that would diminish its sovereignty and independence blocked ratification of the treaty. In his speech, Lodge spelled out a nationalist vision for U.S. foreign policy that Trump now continues. At the UN, Trump echoed Lodge’s worlds from 99 years ago. “We are standing up for America and for the American people. And we are also standing up for the world,” he explained. Throughout his speech, Trump embraced America’s leadership role in the world, but made clear that the purpose of U.S. leadership is first and foremost to secure American interests. Trump was even more forthright in his defense of his trade policies. After explaining how the trading policies and agreements he inherited have harmed the U.S. and benefited rule breakers, Trump turned directly to the greatest rule breaker: China. He gave much the same message to OPEC countries and to nations that receive U.S. financial and military assistance. The globalists argue that these sorts of statements harm America’s standing in the world by placing America’s allies and adversaries on the same moral plane. But they never explain how a nation like Germany, which has been outspoken in its efforts to undermine U.S. sanctions against Iran, and has accepted total energy dependence on Russia is in fact, a U.S. ally. They do not explain why it is more important for the U.S. to stand for populist forces like Egypt’s Muslim Brotherhood in pursuit of chimerical “democracy” than for it to stand with a friendly yet authoritarian regime like that of Egyptian President Abdel Fatah a-Sisi, which shares the U.S.’s profound interest in defeating jihadists. Trump’s essential message is that the foundation of nationalist foreign policy is reality rather than ideology. In accepting the world as it is, his foreign policy doctrine is far friendlier to the nations of the world than the neo-imperialist policies of the globalists. The globalist aspiration to world government ignores differences in cultures and traditions in an effort to push everyone into an amorphous, homogeneous body of “internationalists” under governing structures that reflect the globalist aspiration and faith in nonexistent universal political traditions. Trump waxed poetic about the rich diversity of the world community of distinct and proud nations. “Each of us here today is the emissary of a distinct culture, a rich history, and a people bound together by ties of memory, tradition, and the values that make our homelands like nowhere else on Earth,” he said. “I honor the right of every nation in this room to pursue its own customs, beliefs, and traditions. The United States will not tell you how to live or work or worship. At the conclusion of his speech, he explained how “the doctrine of patriotism” can bring nations together to achieve common goals. As always, he began his explanation by describing America first. He then turned to his audience, the nations of the world. “Inside everyone in this great chamber today, and everyone listening all around the globe, there is the heart of a patriot that feels the same powerful love for your nation, the same intense loyalty to your homeland…. “Our task is not to erase it, but to embrace it…. No longer will it be possible to pretend away a long tradition of America-centered U.S. foreign policy. No longer will it be possible to pretend that the U.S. has but two choices: to isolate itself and abdicate world leadership or to embrace various institutions of global governance that limit U.S. sovereignty. Trump has not relinquished American global leadership. He has restored it.